I am super impressed with this latest easy peasy diy. 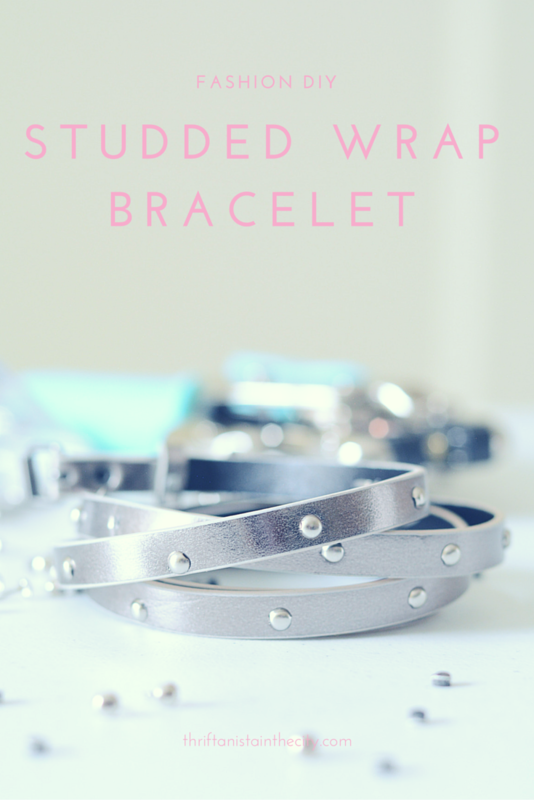 I made a Givenchy inspired studded wrap bracelet. I didn't have to go out and buy a bunch of supplies. Surely, this would never have happened if I had to go on a hunt for studs or cut leather strips. I was able to MacGyver with the tools I had on hand. You will only need three supplies for this diy. 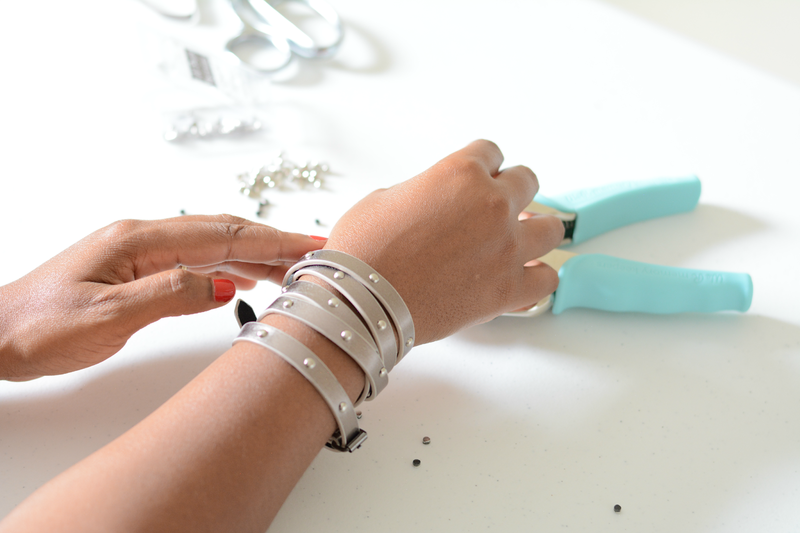 With the addition of scissors, you you can customize the length of the bracelet. Mine is a $0.79 find from the thrift store. I bought a couple of new belts to wear with my vintage jeans. What's great about this project is that I can still use it as a belt when it's not decorating my wrist. You can find paper fasteners in scrapbooking or home office departments of craft or big box stores. they come in other colors too. I used them for one of Violet's school projects and finally have another use for them! The holes were a little bigger than the notches already on the belt but small enough to keep the fasteners from sliding through. I didn't cut my belt down as I wanted a nice full cuff look. 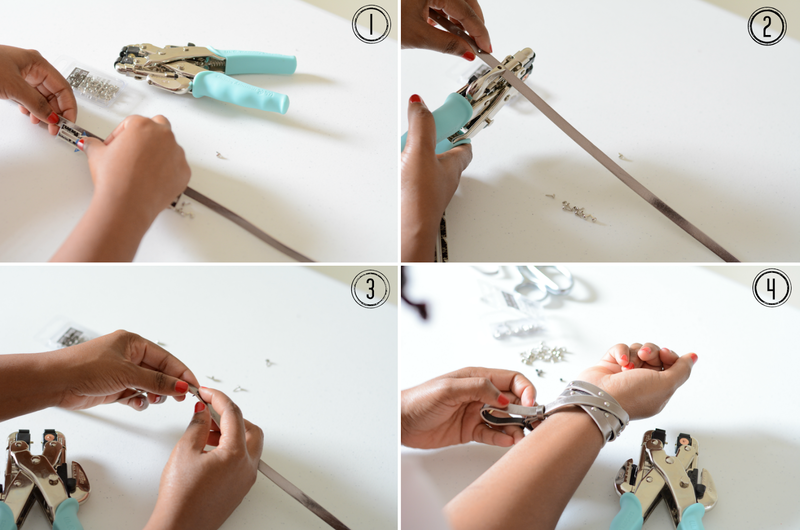 If you would like to do a loop or two around the wrist, you can cut inches from the tail end of the belt. 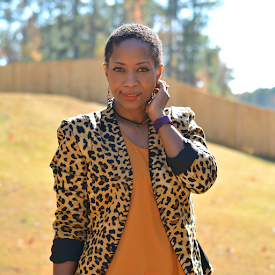 Use your wrist as a guide to reach your desired length. I'm sure I don't need to say it but you won't be able to go back to belt option if you cut it down drastically. Instructions: 1. Measure out placement of holes that will be equal distance from either other. Use the notch spacing as a guide to length. 2. Punch holes in the belt. Be careful getting the holes centered. I lost focus a couple of times and punched wrong. 3. Push paper fasteners through the holes on the right side and fold the tongs down on the wrong side. 4. 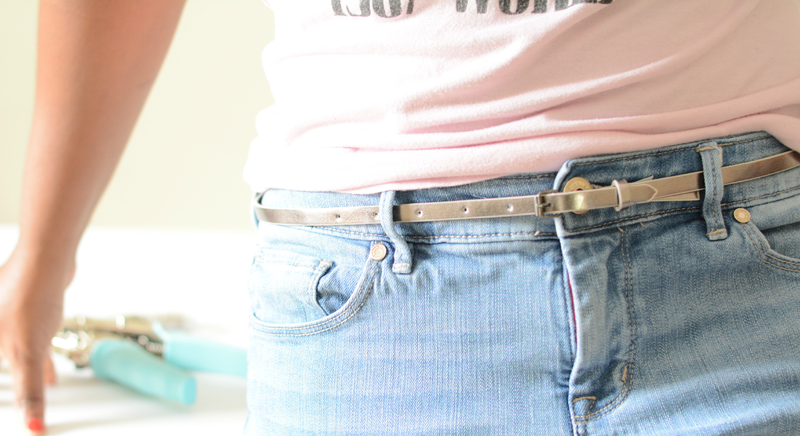 Wrap the belt around your wrist until you've reached the end and fasten the belt buckle.